Chang Hu Xin Yi Men Quan was worked out and edited by Huiwei, a famous wushu monk in Song dynasty, and it was improved by other wushu monk like Jinnaluo in Yuan dynasty, Juexun and Tongxiang in Ming dynasty. So its technique was at a higher level with good structure and distinct features. 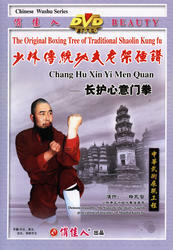 Chang Hu Xin Yi Men Quan is forceful and powerful, plain and simple, with hardness and softness assisting each other and its postures are quite unique and it is good for actual combat. It has great function of improving the attacking skill and boxing level, strengthening your ability of defending yourself..